At a conservative estimate, there are at least 75,000 children in Calcutta who are out of school. They are out of school for many reasons. Some are out of school because they are employed in various occupations (ragpicking, battery recycling, rubber cutting, house cleaning). Others are out of school because they are needed for looking after their younger siblings when both parents go off to work. Sadly, yet others are out of school simply because of parental neglect. CINI (Child in Need Institute) is a Calcutta based NGO that helps bring these children into the ambit of education. This is a project that requires massive community involvement, with social workers fanning the slums and squatter colonies of Calcutta identifying out-of-school children and persuading parents to send their children to school. CINI runs special one-year preparatory centers for these children, teaching them reading and arithmetic, before placing them in government aided schools in the neighborhood. 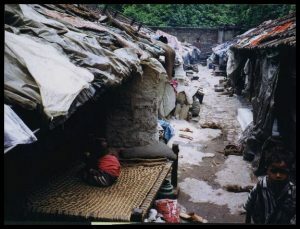 These centers are run in the same slums and squatter colonies (see picture above) where the children live, and are organized with the help of local community leaders. The kids are followed after they are mainstreamed into formal schools, and special coaching schools are provided to at-risk students. CVI has sponsored six such preparatory centers. It is also sponsoring a pilot project to help build up a strong social network to help keep the children in schools: this involves bringing together community leaders, government school teachers, principals, and individual tutors, and providing training on how best they could all work together. 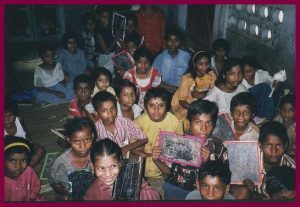 CVI also sponpsored a few needy children for further studies. Reports of these are also included below. CVI supported CINI from 1998-2008. Development of Social Infrastructure and Coaching Proposal. Development of Social Infrasture and Coaching Program Budget, January 2002. Report on Preparatory Centers, January–June 2002. Financial Summary for Preparatory Centers, May–June 2002. Report on Development of Social Infrasture and Coaching Program, January–June2002. Financial Summary for Social Infrasture and Coaching Program, May–June2002. CINI Asha’s Global Strategy for Education of Urban Slum Children.